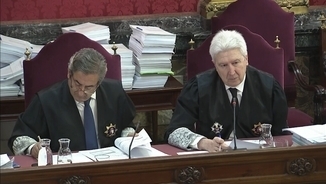 During Wednesday's sitting, as in the sitting on Tuesday, in the Supreme Court in which the Catalan independence trial is being held, something the defence teams had been calling for days ago is becoming especially manifest: the right to contest evidence is being jeopardised and, therefore, the right to defence is being violated. On Wednesday, the defence counsel of Oriol Junqueras and Raül Romeva, Andreu Van den Eynde, requested another video as documentary evidence during the interrogation of a Guardia Civil officer on an action carried out on 1-O in Can Barris. The presiding magistrate of the court, Manuel Marchena, denied it to him once again. "Andreu Van den Eynde: "I request the display of a video, because in it everything that happened can be seen and when it doesn't..."
Manuel Marchena: "I am going to pretend you have not proposed this. Ask a question and carry on." AvdE: "However, the fact that I am requesting evidence must be put on record, is that so?" M.M. :"This is being recorded, and it is the fifth time you have requested a video as complimentary evidence. I know you would like me to confront you, but that is not the case. This matter has already been ruled on. We refer to what has already been ruled." The defence counsels want what they deem to be violations of the right to defence to be expressly put on record. The defence counsel of Jordi Cuixart, Marina Roig, also protested on the fact that the testimonies go beyond the purpose of the proposed evidence. 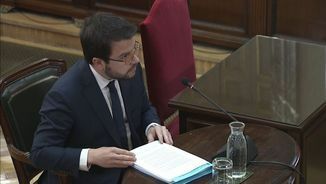 Marchena did not let her carry on, stating that the "four-line" summary that informs on each testimony cannot contain all of the subjects for which they have been summoned, and that this is not grounds to declare the questions inappropriate. Manuel Marchena: "What was requested in this court to assist in the assessment of appropriateness was a brief four-line summary on who each witness was and why he or she was being summoned. (...) There are 500 witnesses. However, to go as far as to believe that everything that is not written down in these three lines must be declared inappropriate by the court is absurd. We will not prolong this any further..."
Marina Roig: "I would like to finish to make myself clear. The witnesses who explain that they have participated in investigations do not appear as investigators or court clerks in the statements, the defence is unaware that they participated in the investigations in which it is stated that they participated and they explain things in which they participated and..."
M.M. :"You said the exact same thing yesterday... please ask a question." 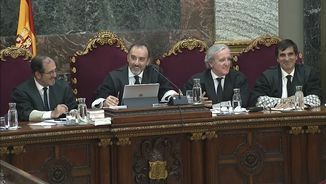 It was precisely on Tuesday and on previous days that the defence counsels of the accused parties also repeatedly protested to the presiding magistrate of the court, Manuel Marchena, at several times, on the fact that they could not display videos to rebut testimonies, or on the restriction in questions, and even on the vulnerability caused by not having the calendar of witnesses sufficiently in advance to prepare themselves, or on legal proceedings that are not on record. The defence counsels have submitted a number of written complaints so that their complaints about the fact that Marchena does not allow the court to put forward arguments may be on record. Presiding magistrate Manuel Marchena went so far as to say that these protests by the defence counsels were intended to generate a "parallel written trial". Marina Roig, the attorney of Jordi Cuixart has stated, in an interview on "El matí de Catalunya Ràdio" , that the prosecution may have "worked on" its witnesses. 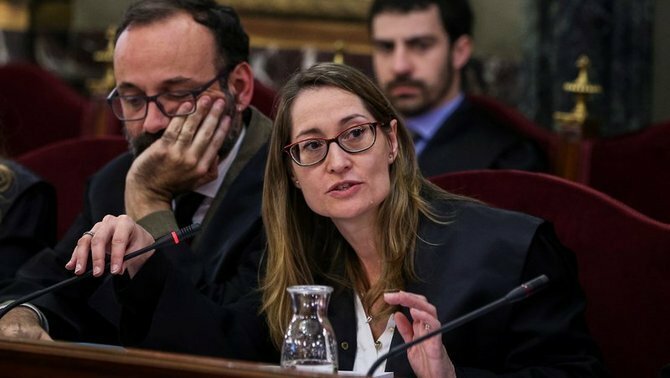 With regard to the Guardia Civil officer who stated that Carme Forcadell had extended her hand from her official vehicle to "agitate the masses" on Via Laietana on 20S, the attorney wondered: "Where did the prosecution obtain this information?" "Marina Roig:" There are two police reports that were drafted expressly on the events of 20S, and this fact appeared in none of the two reports. And the prosecution asked: "Did any official cars pass by?" This does not appear anywhere, and this fact had never appeared during this year and a half of proceedings. Where did the prosecution draw it from? Mònica Terribas: "Do you mean to say that this recovery of the Guardia Civil officer's memory may have been induced? 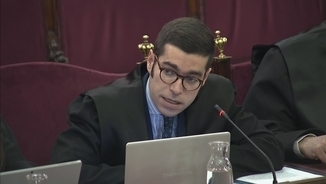 Roig has denounces that witness statements cannot be cross-examined in order to prove that he or she was lying by displaying videos of the events of 20S or 1-O. "I believe that we must protest as many times as necessary and submit as many written complaints as necessary if we are not allowed to justify our objections. We disagree with the court and we believe this creates vulnerability. The narrative is not being seen in its entire scope in the trial, only part of it is being seen. When you attempt to contradict that part of the narrative in an objective way that would manifest the lack of credibility of the witness, not only because he or she is not telling the truth with regard to the Mossos, but rather because what he or she is saying in one part of the narration is false, the rest of the narration loses credibility." Marchena has said that images will be viewed in another phase of the trial. According to Roig, this will not prevent highlighting contradictions in witness statements. According to Roig, another fact that makes the accused unable to defend themselves is the fact that witnesses cannot be questioned on subjects for which they were not summoned. Attorney Andreu Van den Eynde also submitted a written complaint in this respect. Marina Roig added that, moreover, some witnesses are questioned on subjects for which they were not summoned and, in those cases, the defence counsels were unable to prepare their interrogations. That is the case of a Guardia Civil officer who was questioned on the events of 1-O on Tuesday and the defence counsels were unaware that he had been summoned on this subject. "It is impossible for the defence counsels to be aware of whether or not this man participated in the investigation and what he participated in, we cannot prepare the questioning of a man whose Professional Identity Card number does not appear in any reports." The defence counsels argue that being unaware of the witness calendars sufficiently in advance also affects the preparation of interrogations. "We have been complaining. We managed to obtain a calendar for March but we still do not know who will take the stand in April. In any trial, even in very long trials, even when they are months long, the calendar is available on the first day until the end of the proceedings." Roig also explained that written protests are not answered in writing, as it should be done in the court itself, where Marchena does not allow them to justify their complaints. For the presiding magistrate of the court, it is enough for them to be featured in the recording of the trial. First agent of the Guardia Civil declaring before the Supreme Court defines 20-S as "siege"